The most satisfying logo design projects are the ones that do more than just look good. My favorite logos are the ones that tell an interesting story and are designed with meaning. You want what you do to be of importance. The more you put into a logo, the more its audience can pull from it and appreciate about it. I love logos where you can tell the references that influenced it. 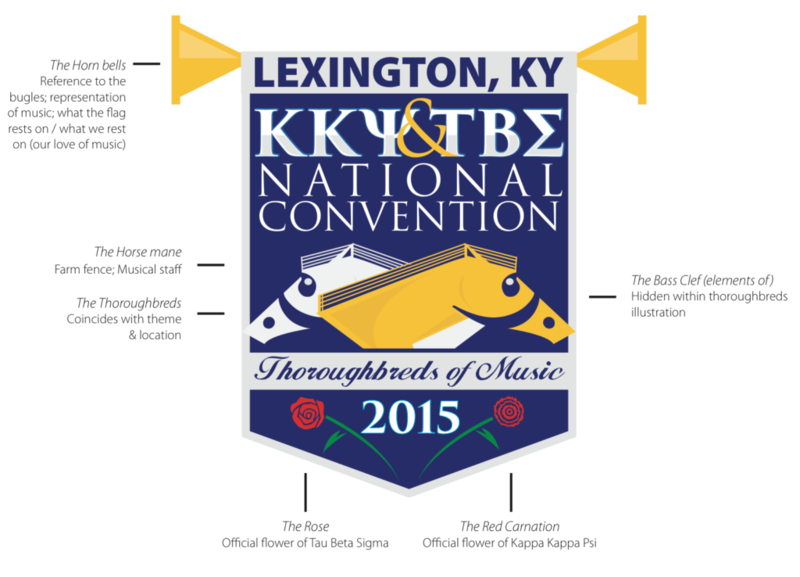 For example, my 2015 Kappa Kappa Psi & Tau Beta Sigma National Convention logo told the story of the locale of our event and the focus of our organizations. Kentucky, home of the Kentucky Derby, inspired the horse motif and the overall banner shape that would be used throughout the brand identity. Within the logo, I was able to reference horns, musical staffs, bass clefs, and the official flowers of the Fraternity and the Sorority. It was really fun to see people catch all the elements I put into it. Those elements represent the amount of thought that went into the logo design. Elements of that was seen throughout the material designed for the event. The meaning & purpose behind a design influences the design decisions. There is great joy in discovering the design elements within a piece of work. It adds to the significance of the design. From a designer’s perspective, it is a much easier sell to a client or stakeholder when you can explain your design decisions and assign a purpose to each one. I want to make things that go beyond the surface level. I want to make things that speak to people. I want to make things that will not just look good but have impact. Meaningful visuals have the capability of enhancing connections we make and last longer within our memories. There is an extra level of creativity you tap into when you are striving for greater meaning in design. It should be everyone’s goal to maximize their creative potential. That is only possible when you are passionate about what you are creating. I’ve written before about how purpose is the intersection of passion and talent. That purpose pushes me to make something meaningful and unique. I find it very satisfying to pack a lot of meaning into a design that can be felt by those who know what to look for.